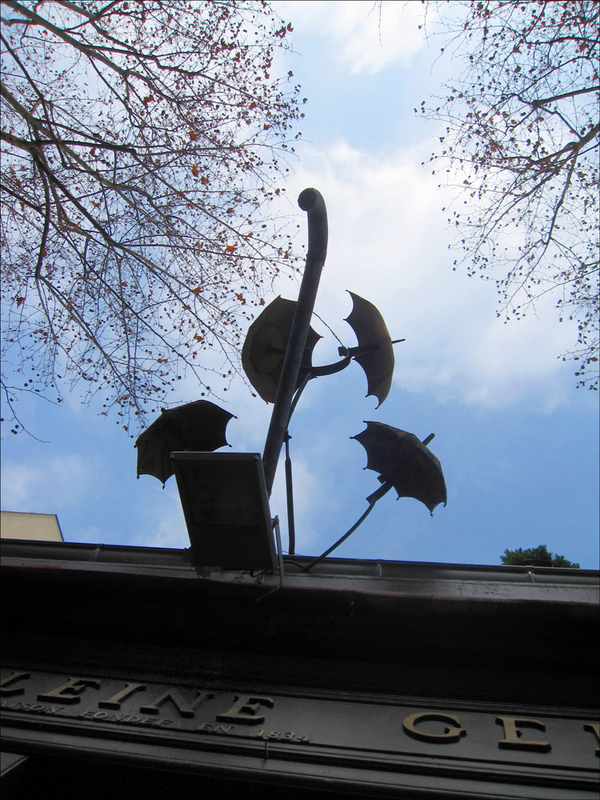 Paris Tips: Celebrating the Umbrella (parapluie-uie-uie)! Splish Splash! Sometimes in Paris, a little rain must fall. No matter when you’re visiting the City of Light—and light sprinkles, don’t leave your parapluie behind. Here’s the deal: The weather here can change at the drop of a Schiaparelli hat. While showers don’t typically last long, I highly recommend toting a little vibrant compact number. “Never carry an umbrella in Paris! There’s a law,” says Audrey Hepburn to Humphrey Bogart in Billy Wilder’s “Sabrina” film. Well, Sabrina, that’s not quite true. In fact, it was the French who invented the folding parapluie (literally, “rain protector”). Though umbrellas have been around since the time of the pharaohs, they originally served as protection from sun, not rain (“umbrella,” after all, means “little shadow”). The folding waterproof umbrella didn’t make its splashy debut until 1709. Jean Marius, a master purse maker (“maitre boursier,” who also happened to invent the portable harpsichord), came up with a design that was water-resistant, lightweight, and practically overnight, terribly chic. It’s probably no big surprise that it was “Sun King” Louis XIV who issued one of the first Royal Patents for the parapluie—as protection for his wigs, according to the palace gossips at Versailles. I can relate! I’ve had those days. Marius quickly launched history’s first publicity campaign for a fashion accessory, landing product endorsements from other notable bigwigs, including Ben Franklin (who even hated hair pieces). Soon it became one of the most highly coveted French souvenirs. Those early parapluies were indeed stylish and sturdy, but expensive. Fret not, the 18th century globe trekkers-of-the-day weren’t left empty-handed. Umbrellas could be rented by the hour at tourist hot spots and bridge crossings throughout Paris. Don’t leave home without it! And you won’t either, if you pay attention to some famous Paris films before you pack. For example, in “The Last Time I Saw Paris,” heroine Helen (Elizabeth Taylor) loses her umbrella not once, but twice, before finally succumbing to pneumonia. Not you! 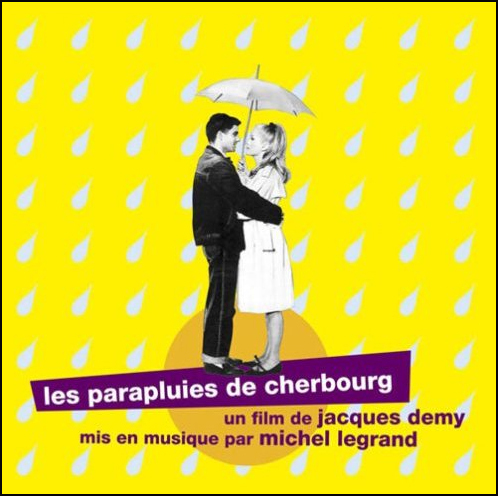 Les parapluies also loom large in “Les Parapluies de Cherbourg,” where Catherine Deneuve really knows how to sell an umbrella, along with trench coats and pointy patent leather shoes with kitten heels! If you forgot to pack an umbrella, you can pick up a relatively cheap (and pretty) one at Monoprix. Selling everything from groceries and wine for your picnic, to sunglasses, band-aids, and skinny slacks, it’s one-stop shopping for all your strolling needs. Looking for a fine vintage parapluie? I often spot them at the fleas and brocantes for just a few euros. Cha-Ching! By the way, bringing a “little shade” with you can be a lifesaver on those hot summer days, too. Umbrella broken? Don’t throw it out! Get Thierry Millet on the horn. 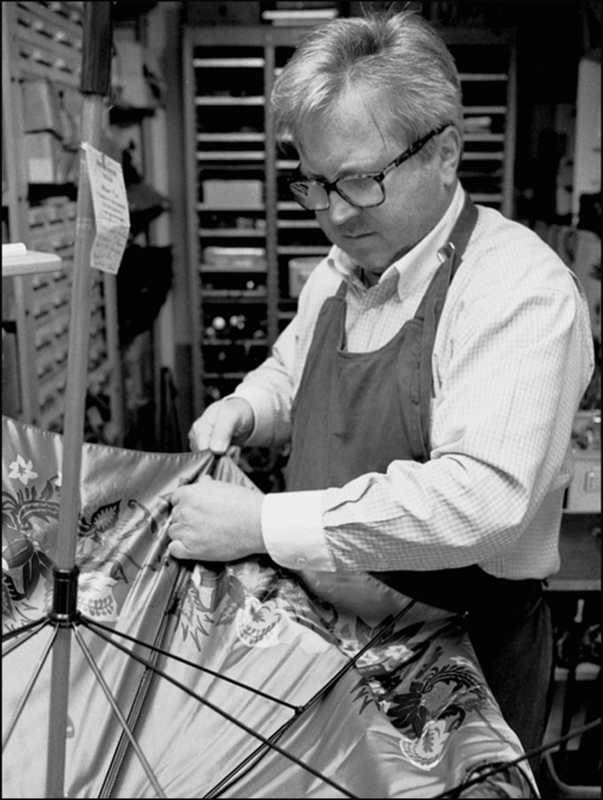 Or stop by PEP’S (223, rue Saint-Martin, Passage de l’Ancre in the Marais), one of the last surviving umbrella repair shops in Paris. Millet will save the day and your hairdo! This historic atelier is worth a peek even if your umbrella is in fine working condition. Repairing up to 10,000 umbrellas a year, PEP’S won’t stick it to you. An average repair costs just 10 to 15 euros, less than an umbrella. Good for the planet and your pocketbook. See, it is easy being green! Also, ask to see his signature Eiffel Tower-shaped umbrella. Pack the hanky. It’s another Zou Bisou Bisou heart breaker! Great photo at the top, reference to Les parapluies de Cherbourg and one of the greatest unsung professions, the umbrella repairman. Love love love it! Also the idea of Louis XIV not wanting to get his wigs wet is still making me chuckle. Who knew…love you attention to detail. Good luck…hope you find something fun. Parapluie is one of my favorite French words! I never knew any of this about umbrellas. It’s funny that they weren’t invented until 1709. Love the part about Louis and the wigs too! Big Wig = Big Power !! Thanks, Vivian! The Sun King has always been one of my favorite fashion icons. 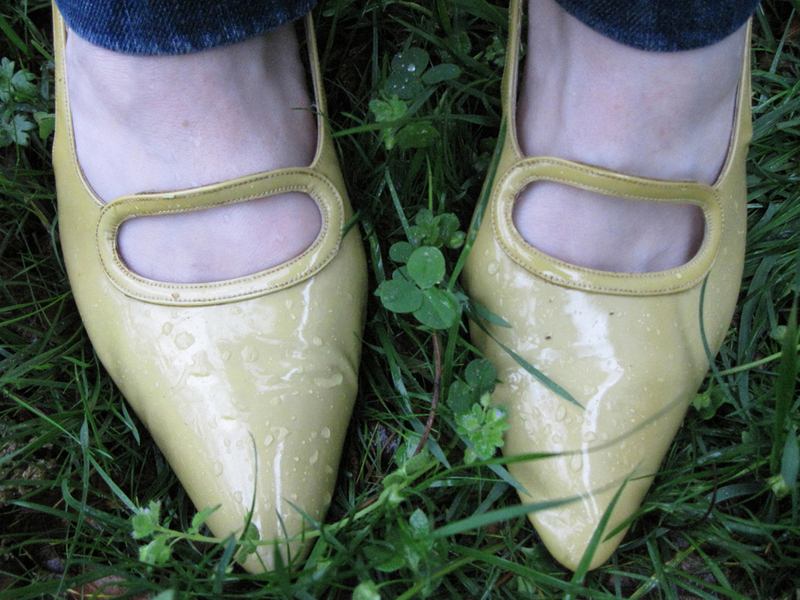 For the love of mules and Christian Louboutin, Louis XIV also made the red heel popular. He even decorated his heels with miniature battle scenes! I’d love a pair. (Also, have you seen Les Parapluies de Cherbourg? If not, add it to your list. The vibrant sets and wallpaper will knock your socks off! T.
Very Informative. Thanks for the lesson on umbrellas! Loved it! Nice (not boring) history lesson. Thank you for the shopping tips, you are making Paris accessible to those of us who only dream of living there! We have more rainy days than you do in Paris. My daughter spent a year living in Paris as a student so I got to visit quite a few times. Your post captures the spirit of the city as I remember it so well. Fun and informative…can’t get any better than that! As for the etymology of “parapluie”, a friend of mine and i went through a list of French words that have the prefix “par/para” for protection. Like parasol, against the sun, parchoc (car bumper, against bumps), parachute (against falls)…what a wonderful language French is! Thanks for your informative post, Theadora! Thank you, Paul! Yes, when it rains in Paris, blue skies are usually right around the corner. I love photographing the old cobblestones in the sunlight after a rainstorm or street cleaning. They sparkle! Not everyone digs the constant changes in the weather and lighting. It nearly drove Edward Hopper mad! Love this! 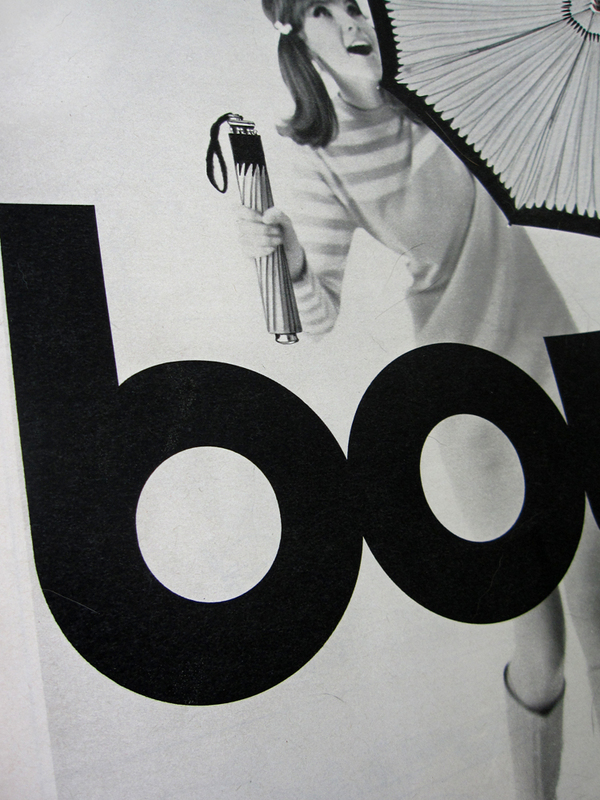 I adore umbrellas (I have to in this weather!) and I would love a Parisian one! Thanks Theadora! That’s just about the cutest, smartest, post I have ever read–I learned so much! Who knew? Thanks for introducing a little sunshine into my day. What a wonderful post! Light and entertaining, yet informative. I’m so glad you stopped by my damp post today otherwise I may have missed this. I will admit that as an Oregonian I grew up believing only wimps used umbrellas… as an adult my tune changed. I can still be seen trekking through the rain without one quite frequently though as it is sometimes more hassle than its worth when the rain is coming down sideways. 🙂 Thanks for sharing and I look forward to reading more when I’ve got a bit more time. If your umbrella becomes completely threadbare, you can use the skeleton to make a mobile. I’m thinking of making one with pictures of octopus and robots as there are sadly no umbrella repair shops around here. Hahaha…as soon as I find the darn thing. I left it outside on a table and that’s the last I’ve seen of it. I’m hoping that it went to the shed or something. I just knew the Luis XIV would be the ONE who would issue a patent for the umbrella! I understand the need to protect those wonderful wigs. Theadora, you have once again enchanted me. Oh, your post references all these movies I love so much. Parapluies de Cherbourg in particular. Yes, it’s so moving at the end, really. And it’s surprising to me to see a musical in French. I love musicals, but it’s a very American genre (or at least that’s what I’ve always thought). Will check them out! Thanks to you too or, merci bien (oh I’m hilarious).